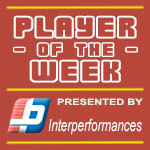 30-year old guard David Seagers (188-G-88) had an amazing evening in the last round for second-ranked Bima Perkasa and receives a Interperformances Player of the Week award for round 16. He had a double-double of 25 points and 12 rebounds, while his team crushed Satya Wacana (#5, 4-9) with 21-point margin 79-58. Bima Perkasa maintains the 2nd position in their group in Indonesian league. Bima Perkasa is a typical solid league team placed somewhere in the middle or a little bit lower in the standings. They need more victories to improve their 7-6 record. Seagers just recently signed at Bima Perkasa, being already a very valuable addition to the team. David Seagers averages this season 21.6ppg, 9.8rpg and 4.8apg. Second best performed player last round was Savon Goodman (198-F) of top-ranked Stapac. He is American forward in his first season at Stapac. In the last game Goodman recorded impressive double-double of 20 points and 11 rebounds. Of course he led Stapac to another comfortable win 77-63 over the lower-ranked Pacific Caesar (#4, 4-8) being unquestionably team leader. It was definitely game of the week between two contenders to the top position in White Group. Stapac consolidated its place in the very top position of the standings. His team belongs to top of the standings with 12-1 record and is considered one of the main candidates for the league title. Goodman is a newcomer at Stapac and quickly became one of team's most reliable players. Third place about best performers goes to forward Muhammad Hardian (189-PF-93) of Pacific Caesar (#4). 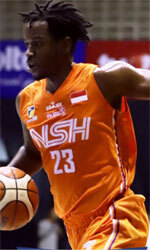 Hardian scored 26 points and grabbed six rebounds. Despite Hardian's great performance Pacific Caesar lost 63-77 to #1 ranked Stapac. But his team cannot count on just a single shooter as he also needs help of the other teammates especially in such crucial game. The chances of Pacific Caesar not to end season at such low position in White Group, however are less than slim as they have already lost 8 games, recording just four victories. With bigger assistance of his teammates, Hardian could try to bring Pacific Caesar's a little bit higher in the standings. Hardian has a very solid season. In 3 games in Indonesia he scored 10.3ppg.